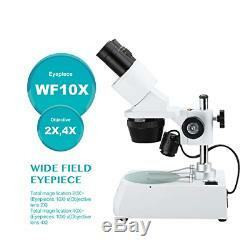 WF eyepiece WF10X, Great vision makes observation more comfortable. Plated film lens The objective lens is used to anti-reflection coatings. There are 2X and 4X the lens can be used. Ergonomic design Pupil distance can be adjusted. Make the watch more convenient. Replaceable stage A round stage. The glass stage can be transparernt, and the black and white stage can block light. Diopter adjustment Professional dioptric adjusting. You can balance the left eye and right eye's poor eye sight to make the image clear. Equipped with an environmentally-friendly rubber eye cups, it can be installed in the eyeipece to hide the light from the outside. LED light source Two kinds of light source can be used. Select the right light source according to the target. The eyepiece and objective : to observe the object, pay attention to protect, in order to avoid the dust, oil, Sharp objects into the lens, the impact of observation. If there is any oil, dirt, etc. Are available Paper with ethanol, do the circle shape clean, do not touch the lens. Focusing handwheel:use the handwheel to adjust up Coke to observe an boject. Object stage: for observing objects, slide table is used to fix two table Observe the object. 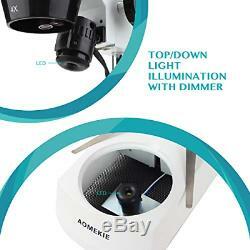 Daily maintenance: Microscope must, in accordance with standard operation, after use, clean the lens and the fuselage. Don't have to When on the smooth and dry place, cover dust cover, to prevert dust pollution lens. 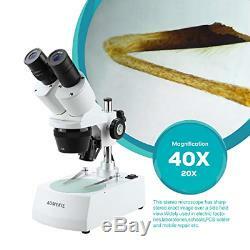 This kids microscop comes with 20X & 40X magnification settings, longer focal length for inspecting large-scale specimens. 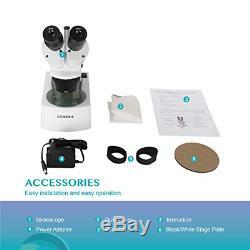 The microscope is equipped with an eyepiece cover. When you watch it, you should put on the eyepiece cover to prevent the light from entering, it's offer you clear crisp images. The Electron Microscope 45 degree inclined binocular head ensures an easy observation and rubber eye-guards provide further comfort. The angle between the two prism house can be adjusted freely between 60 degrees Its offers high resolution and good depth within a broad field of view. 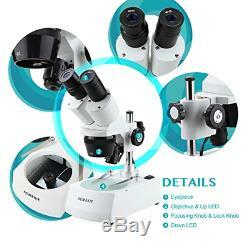 Microscopes upper and lower illumination has 10W halogen light source to illuminate specimens, forward-mounted binocular viewing head with pair of 20x wide field eyepieces, adjustable pupil distance, and 45-degree inclination to simplify viewing for young users, its gives sharp clear stereo images. 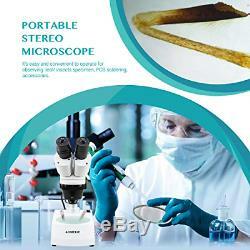 This children microscopes is useful for many applications. It can be used in geology, forestry, archaeology, agriculture, biology and is appropriate for educational purposes in hospitals and schools. It is great for the exploration of the world of surface details and fine structures of various materials like wood, metal, solder, semiconductor and stone. 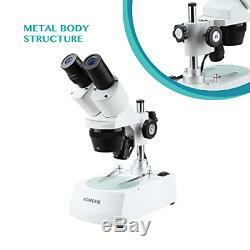 It is perfect for the examination of insects, plants, rocks, stamps, jewel or virtually any three dimensional objects. 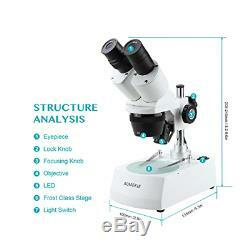 Microscopes for student has sturdy all-metal pillar stand and a versatile illumination system that provides both incident (top) lighting and transmitted (bottom) lighting. You can choose between incident illumination shining down onto the object or transmitted illumination through the frosted stage plate. The first is used for the observation of three-dimensional objects and the second for the observation of slides (the slides not included). It's can up and down focusing function, free to adjust. 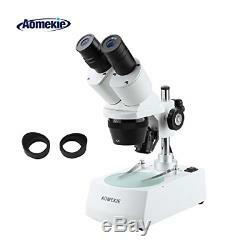 Aomekie Stereo Microscope 20X/40X Professional Binoculars Microscopes for Kids. 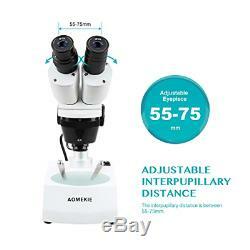 The item "Aomekie Stereo Microscope 20X/40X Professional Binoculars Microscopes for Kids" is in sale since Sunday, January 27, 2019. This item is in the category "Business, Office & Industrial\Healthcare, Lab & Dental\Medical & Lab Equipment, Devices\Microscopes". The seller is "grand_cogs" and is located in Manchester.